and first President of the RAF Ex-POW Association. James AG Deans was born in in Glasgow on 25th January 1914¹, though some sources say 1913. In his wartime work, because of his natural leadership abilities, he commanded respect from his fellow POWs, who elected him Camp Leader. The Germans also respected him. He was trusted by many thousands for his quiet but firm decisions delivered with a CO's aplomb. He also masterminded a powerful intelligence gathering network. Dixie earned the eternal gratitude of thousands of POWs for his handling of their welfare and his leadership. In the latter days of Hitler's Germany he guided 2,000 fellow POWs to freedom through war-torn Germany. He died on 18th February 1989 at the age of 76 after a 50 year battle against multiple sclerosis. In September 10th 1940 Sergeant Pilot JAG Deans of 77 Squadron took off from RAF Linton-on-Ouse in a Whitley bomber P5042 to attack Bremen. His aircraft was hit by flak and crash landed at Venebrugge (Overijssel), 38km ENE of Zwolle, Holland. He mustered his four fellow crew members in front of their captors. The words, familiar to many POWs "For you the war is over" were in Dixie's case in particular to prove remarkably inappropriate. His POW leadership role, especially in the Reich's latter days was just one facet of his fight for the POWs against the Germans. In Stalag Lufts I, III, VI and 357, he was crucially involved in a wide range of tasks, from maintaining morale, through organizing trading among POWs (used to devastating effect against the Germans), to facilitating escapes. At Stalag Luft III - of Wooden Horse fame - Dixie held the weekly meetings with the Germans on behalf of the commissoned and other rank POWs. He enabled George Grimson to escape and live in hiding in Germany for six months in order to set up a safe escape line for others who got away. He also organized the use of radios, built by in the camps by means of bribery of the guards, through which POWs could hear the BBC news. This kept them in touch with the events of the war - and often better informed than their captors - which did wonders for morale. and Oberst von Lindeiner. Major Smoleit in attendance. 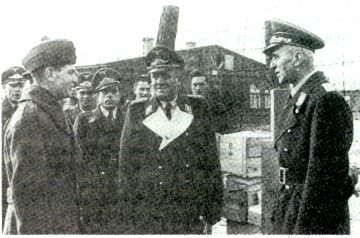 His influence on the trading system among POWs enabled systematic compromising of German guards in the camps. This yielded much valuable escape material - maps, train timetables, compasses as well as tools, photographic film and chemicals etc. At one stage Dixie is said to have held a store of seven million cigarettes for the purpose of paying off German informants. With historical hindsight his most valuable work - and that of a select band like him - was in passing back secret information to MI9 in the UK. MI9 was the intelligence branch responsible for escapes and evasion and gathering information from within the camps, in which Airey Neave played such a large part. Dixie led a very hush-hush group of prisoners scattered throughout POW system, who fed back intelligence to MI9 through a coded messages in POW letters home. The code was based on the page numbers of an English-German dictionary and was thought to be virtually unbreakable. Molly, his wife, had no knowledge of what he was doing, until in mid-1943, she received a carefully worded letter from the War Office. She, like other families in the same situation, was asked to make no comment in her replies on anything in her husband's letters that she might find puzzling, and asked her to overlook any peculiarities she might notice in his style of writing. The information received by MI9 was often exceptional. The widespread POW network was able to warn of the V-weapon research being carried out at Peenemunde; factory developments and relocations (which helped in the planning of bombing raids); and, later in the war it was able to provide the precise specifications for the armour plating of the new and powerful Tiger Mark VI tank. The climax of Dixie's wartime career reflected his own strength of character and his deep knowledge of German psychology garnered during his POW years. In March 1945, with military and civil structure of Hitler's Germany falling to pieces, he took charge of 12,000 POWs on a month-long march across war-tossed countryside towards the approaching British armies in the North West. At the outset the POWs were captives, guarded by the Germans. But in the fog of war, and with a desperate requirement to keep alive, feed and keep organized this huge mass of men, this captivity was ambiguously nominal. Increasingly Dixie took charge of the daily details of maintaining survival. He demanded tight discipline, recognising that it was important to establish a moral advantage over those about to become captives themselves. It was not long before he was bullying the German in charge for food, transport for the sick, and for better accommodation at nights. On one tragic occasion the column was strafed by a squadron of roving RAF tank-busting Typhoons which killed sixty prisoners and wounded hundreds more, mistaking them for an enemy column. But the prisoners did not, even then, lose their spirit. However this tragedy made Dixie decide that he must get through to the British to warn them of the column, in order to bring it to safety as quickly as possible and to prevent further accidents. He demanded that the German commandant, Oberst Ostmann, allow him to set off for the approaching British armies. Ostmann agreed, and Deans cycled through the ill defined battle lines at great risk to himself. He forced himself into the presence of the local commander, General Barker, to alert him to the problem. Dixie then insisted on returning to guide his men personally to a relatively safe area near Lübeck. It was Sergeant Deans who accepted Oberst Ostmann's and his mens' surrender. Dixie was not vocal about his many achievements. The award of an MBE was viewed by many as inadequate recognition of all that he had done - achievements all the more remarkable when it is remembered that sclerosis had begun to affect him in 1940. Post-war, Dixie became a senior administrative officer at the London School of Economics, from where he retired in 1977. The student unrest which he had to face towards the end of his time there was something he sometimes had difficulty in comprehending. Cal Younger recounts that a group of RAF ex POW began meeting in 1949, pooling names and arranging a first reunion in 1950. The publication in 1956 of Cal's No Flight from the Cage boosted interest. 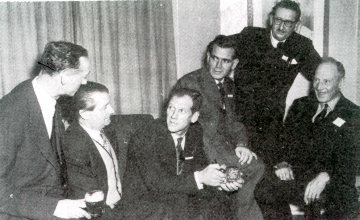 The publishers were persuaded to contribute to a Reception at The Pathfinders' Club. Lord Tedder was invited and not only came but like the rest signed Dixie's copy of the book - he wrote 'With admiration and respect'. In 1961 Dixie took part in the This is your Life programme on 'Wings' Day. The first international reunion of RAF Ex POW took place in 1962. A few months earlier Dixie suffered a devastating episode of multiple sclerosis, from which he never really recovered. It was decided to establish an Air Forces Ex POW Association formally and Dixie chaired the inaugural meeting in March 1963. The Association took part in the events associated with the launch of the Great Escape film later that year. In 1966 Cornelius Ryan published The Last Battle in which no less than ten pages were devoted to Dixie's exploits. In 1969 Dixie resigned as Chairman of the Association as the meetings were getting too much for him, but he was elected as President for life. He remained active in Association affairs. In 1977 Dixie received a Jubilee Medal. Thoughts of awards never concerned Dixie himself, however much others thought he had deserved much more than the MBE he had been given. The silver eagle presented to him by the Association in 1982 was much more important to him. 'What is likely to be remembered most clearly by many readers is the outstanding performance and personality of Dixie Deans, the Sergeant who became Camp leader of the NCOs' compound at Stalag Luft III and whose name was before long held in high regard not only throughout the prison camps, but also among the Germans, in the British Air Ministry, and in the Red Cross Organisation in Geneva. Dixie left his widow Molly, and a son and a daughter. He is much missed by his many friends in the RAF Ex-POW Association, and the other Associations of which he was a member, including the Surrey Branch of the Aircrew Association. "Good-bye, Colonel Ostmann," said Deans. "Good-bye, Mr. Deans," said Ostmann. "I hope we meet again." Then Deans repeated "Ten-shun!" and Ostmann and his guards marched into the British POW compound. Is it known if Messrs. Deans and Ostmann ever did meet again? In April 2010 Cal Younger, editor of The Kriegie wrote "I am almost certain that Dixie and Ostmann never met again."